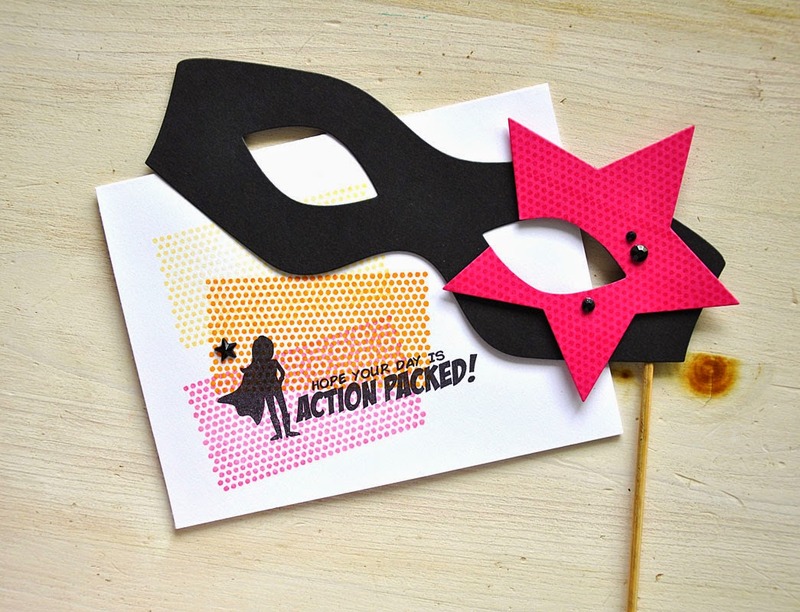 Superhero and Superhero Mask Dies by Lexi Daly. The star on the mask was cut using the Enclosed: Star die. 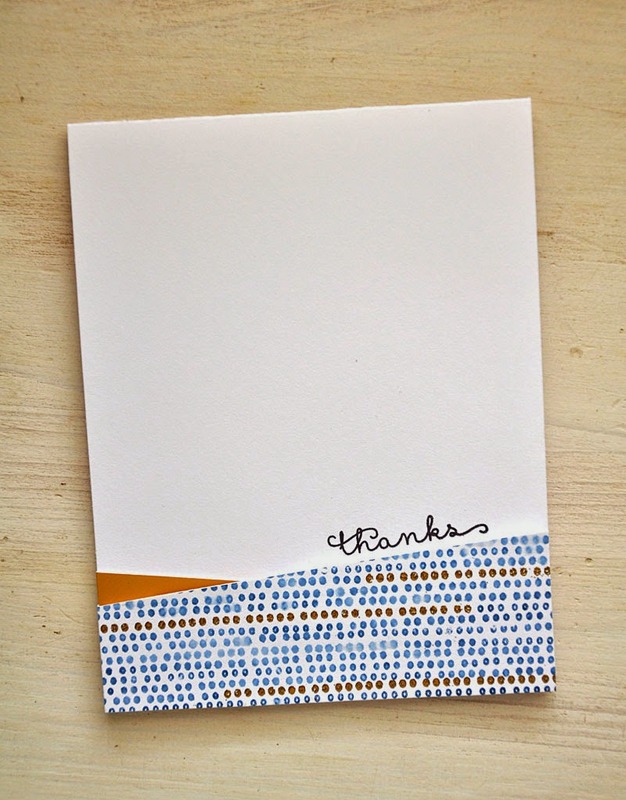 I love the look of these watercolor dots. 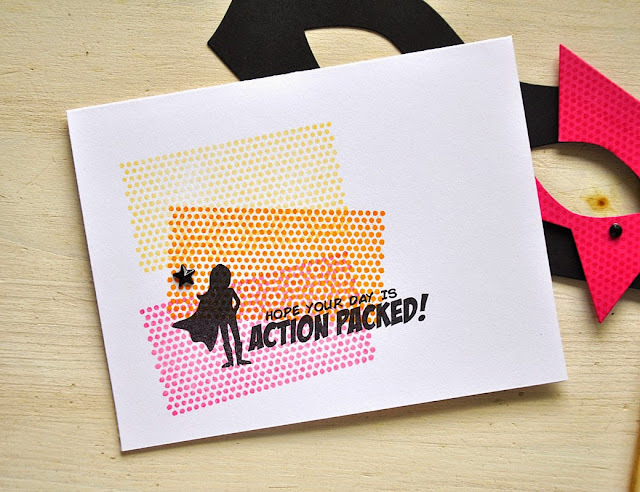 Simply inked up the dotty background stamp, sprayed with a bit of water and stamped. 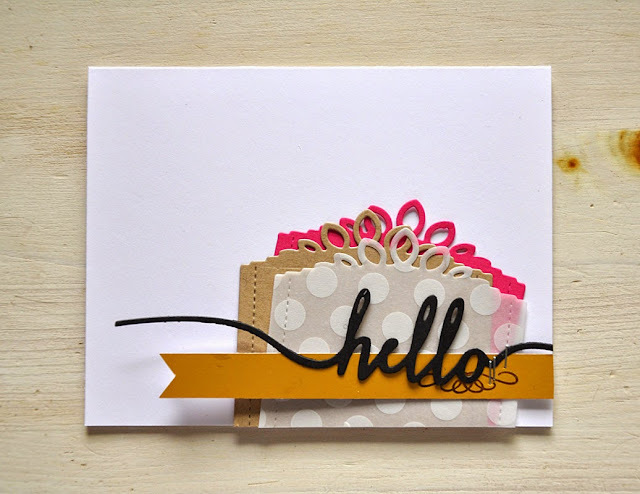 Petite Places: City Station by Betsy Veldman. Text Block: Dad die by Lizzie Jones and Center Style: Masculine by Dawn McVey. Center Style: Feminine by Dawn McVey. Hello and welcome to day 5 of the Papertrey Ink May countdown! 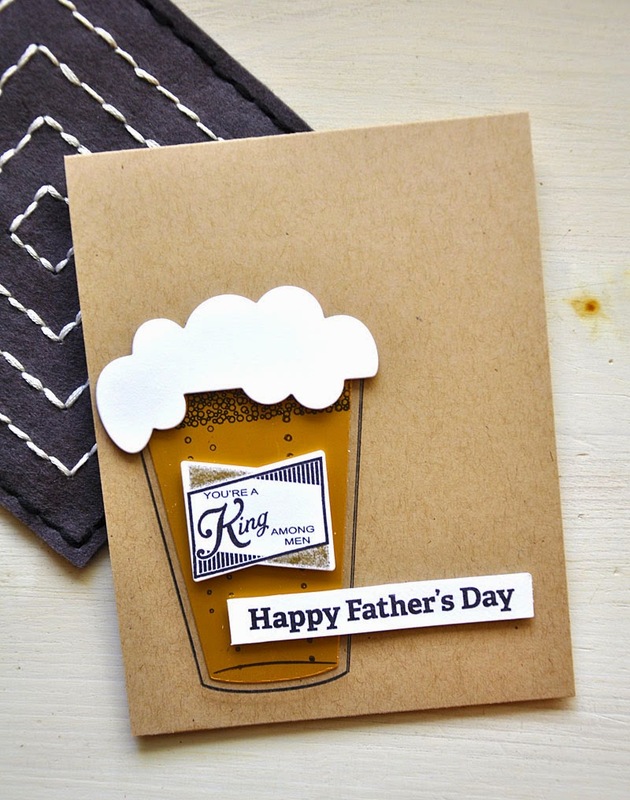 Today's group post is all about handmade gifts and cards for guys. 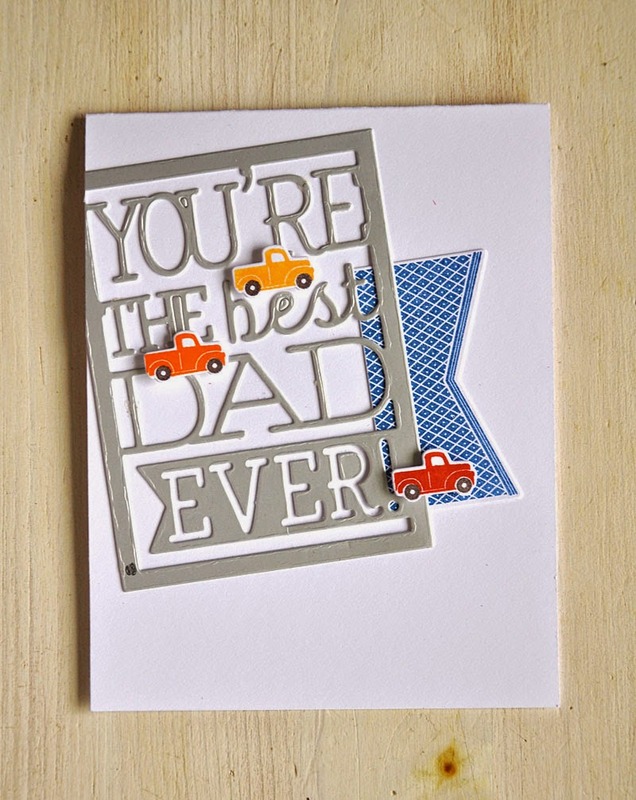 No need for concern when it comes to creating cards for the men in your life. We've got you covered! Your inspiration folder is sure to fill up after today's design team challenge. 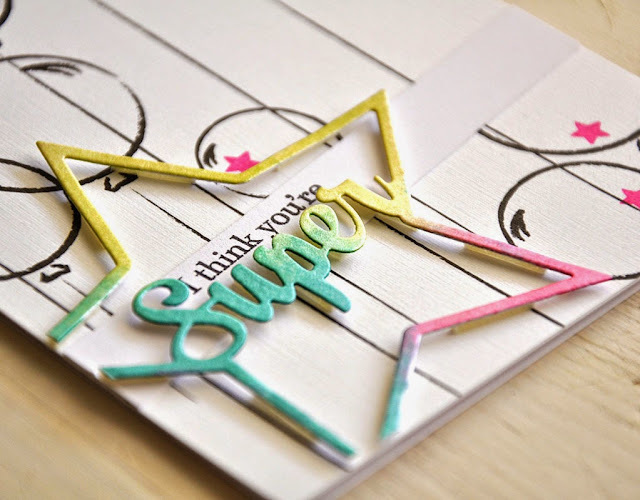 My inspiration card found here (created in 2010) made for a great starting point. I knew I wanted to borrow the idea of using the acetate to create the look of glass, but everything else had to go. Bye bye flowers, pretty label, and ribbon embellishments. I did manage to stay pretty close to the original color combo and layout though. 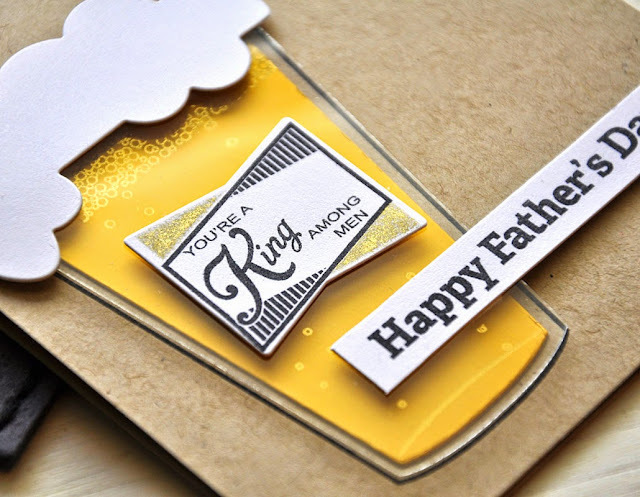 When creating cards for guys, keep things simple... You really can't go wrong with sticking to neutrals. Then, with the addition of some metallic (either ink, cardstock, or staples) there really is no need for further embellishment. Most men really could care less about the extras, but the shimmery added touches will be enough to capture their attention and keep you happy with your creation. I switched out the cute label for a super cool one, created using the Craft Brew stamp set & dies. No ribbon needed after adding a touch of gold ink. The beer inside the glass and the acetate were die cut using the Pub Glass dies. I just LOVE how the beer turned out! 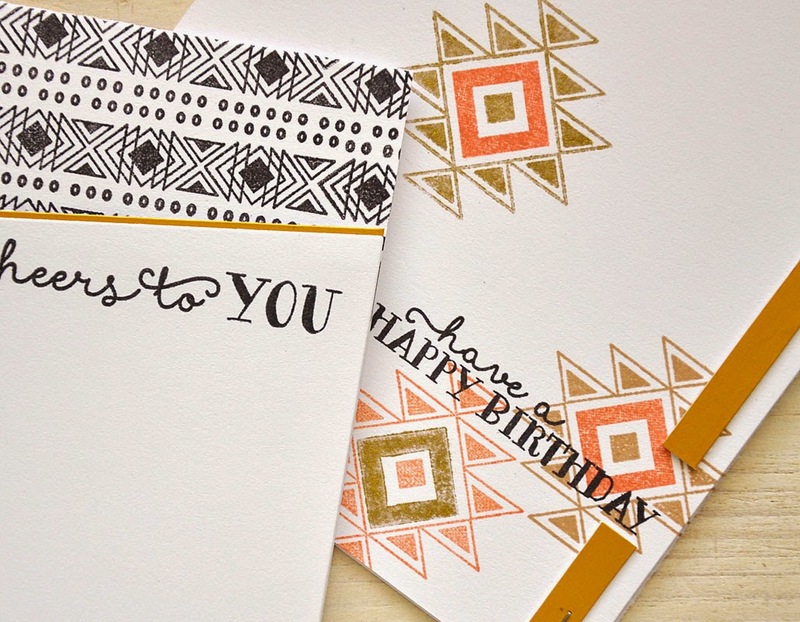 It was die cut from luxe gold cardstock and stamped with bubbles using Versamark ink. I was amazed by the transformation the ink made! The Versamark shows up so well on the gold. The acetate was attached using foam adhesive, which I hid behind the tag and sentiment strip. 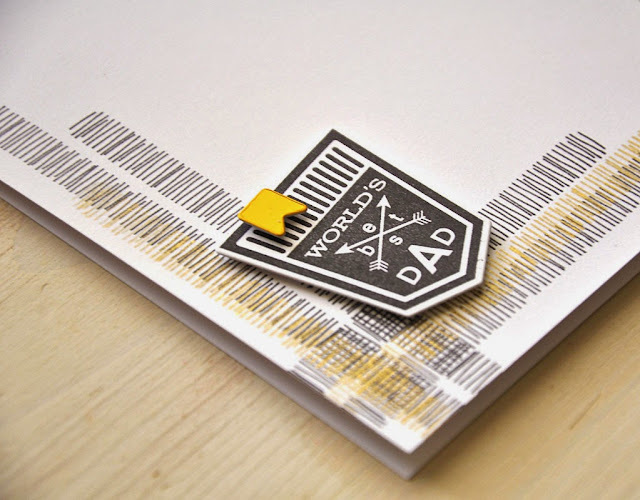 The sentiment is one from the soon to be released Keep It Simple: Father's Day stamp set. 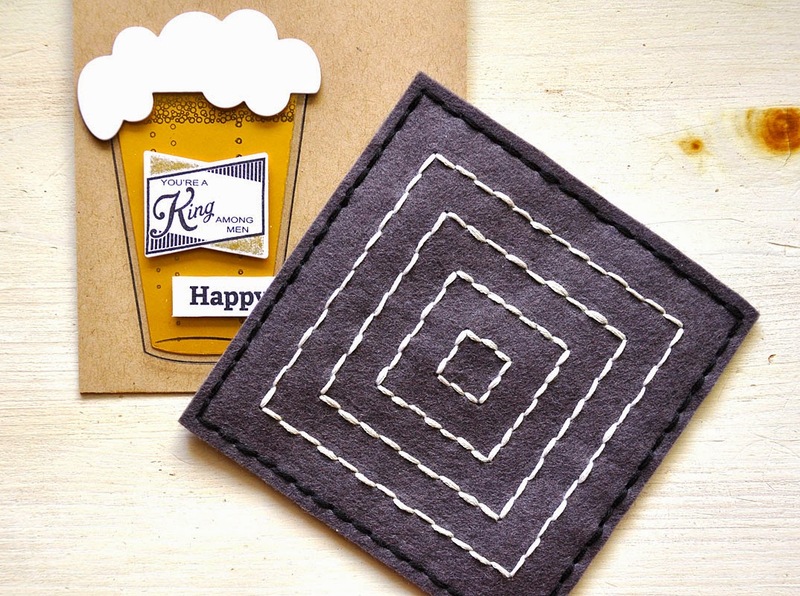 The coaster was created from smokey shadow felt. I die cut two pieces, the front featuring the design and a simple piece for the back. Black embroidery floss for the outer edge and two shades for the squares in the center. I sure wish I would have chosen two colors that differed a bit more, it's hard to tell them apart in photos. 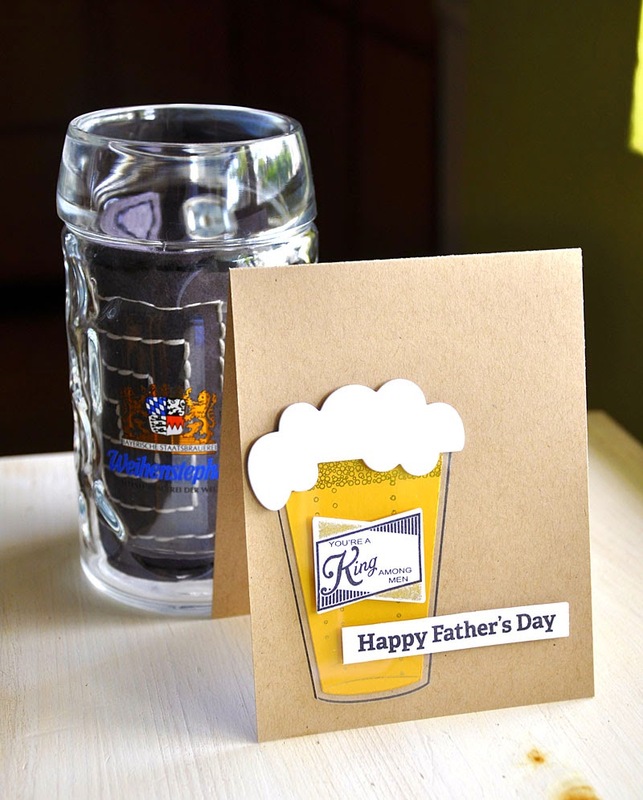 The hand stitched coasters can simply be rolled up and placed inside of a mug for perfect presentation. Let me finish today off with another look at Southwestern Style. 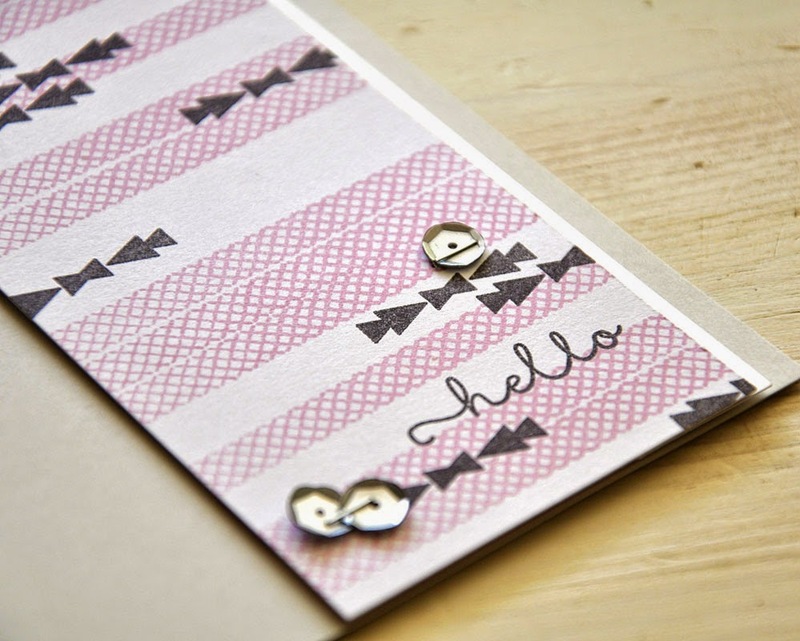 This simple design is one that can be recreated over and over again, and never get old. 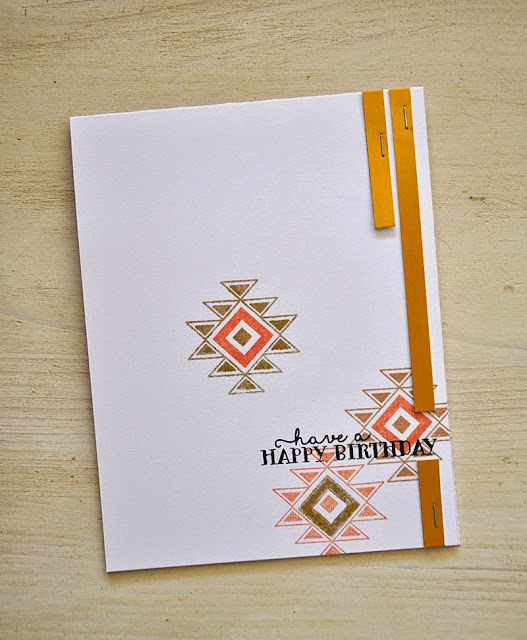 Simply replace the border image with another one from the same Southwestern Style stamp set. Switch up the colors too or keep them the same. Pattern paper strips would look great too! 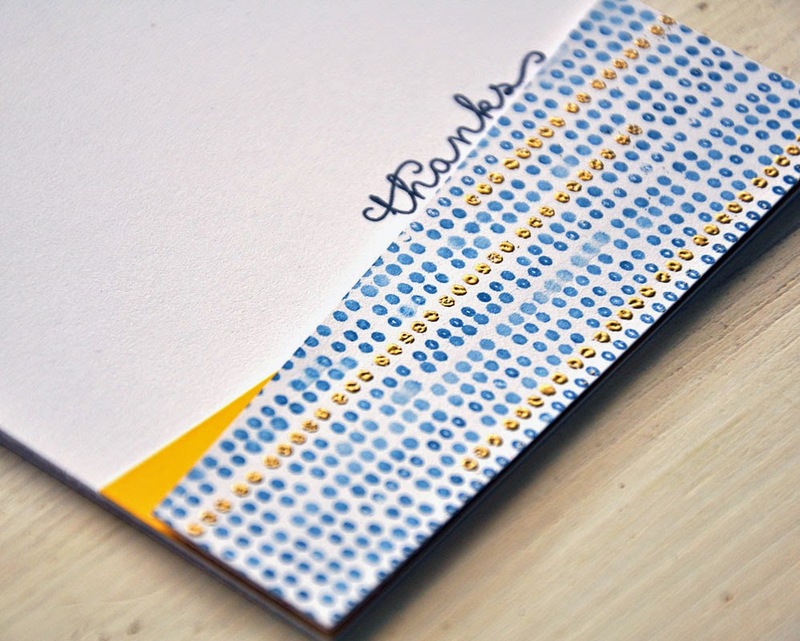 Amazing how a bit of gold ink transforms a simple card! 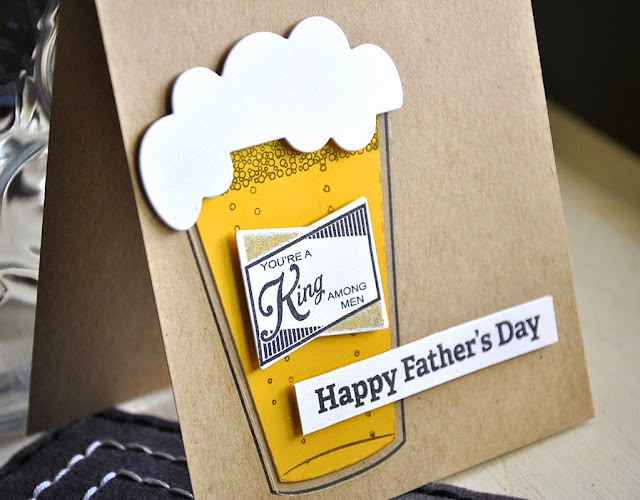 This card suits a man or woman well. An overall black and kraft motif with a few pops of color... gold, scarlet jewel and ocean tide. A couple lines drawn by hand and a few staples to finish the card off. 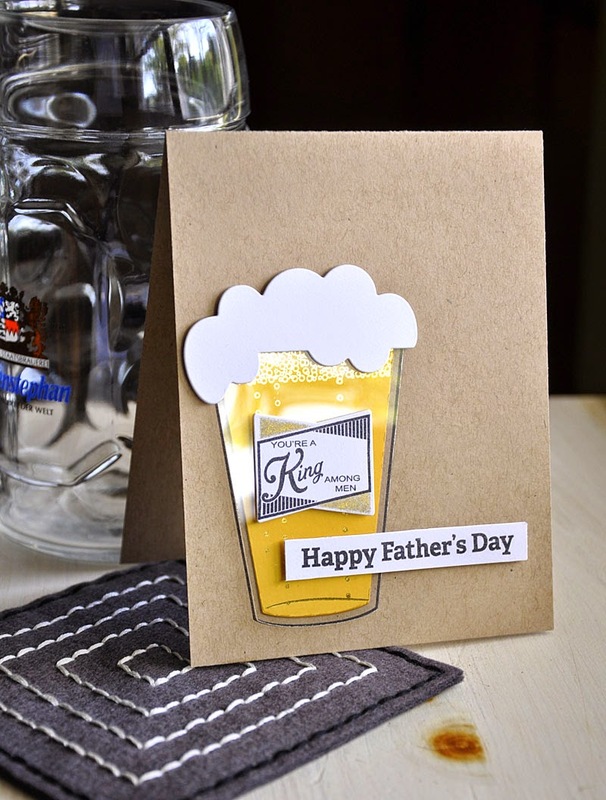 Well, that concludes today's look at gifts for guys using the Craft Brew stamp set & dies, Pub Glass dies, and Stitched Coasters dies. 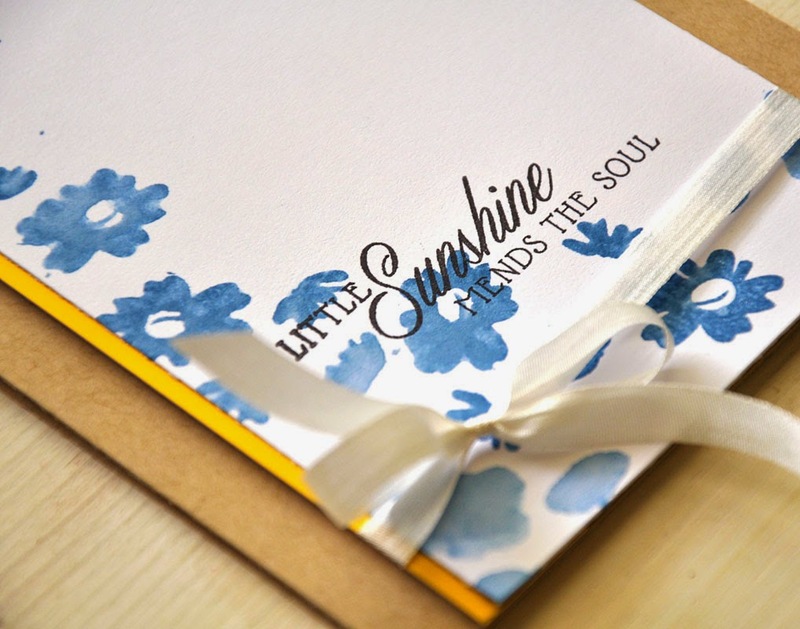 Just remember... all that you have seen today will be available for purchase through Papertrey Ink, beginning May 15th. 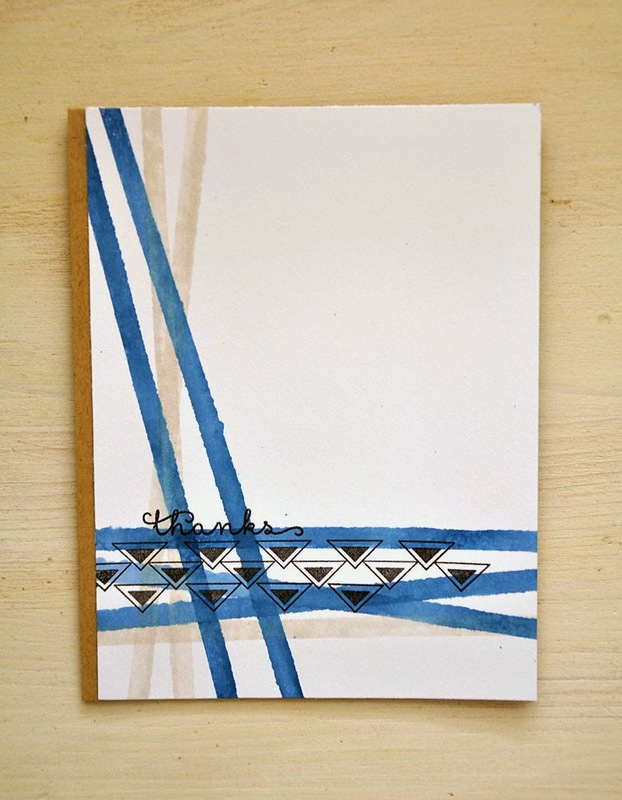 More details on these products can be found at the Papertrey Ink blog. 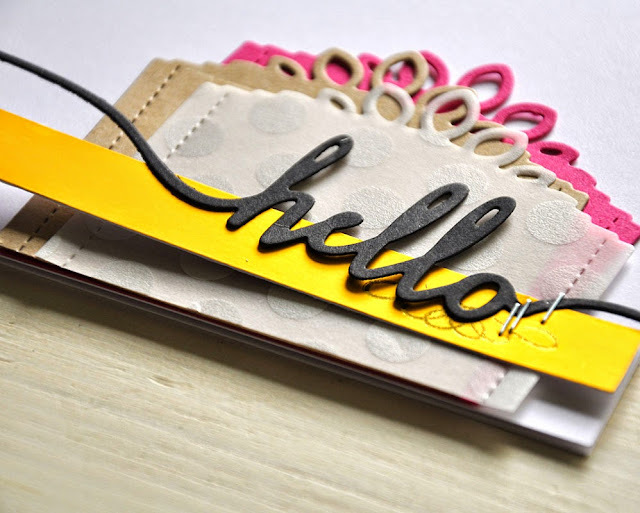 Hello and welcome to day 4 of the Papertrey Ink May countdown! 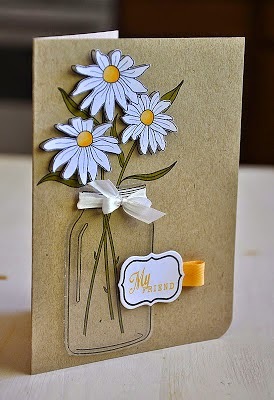 Today's group post is focused on the new Make It Market Mini Kit: Garden Gild. This kit is so on trend! Such a great combination of colors... and GOLD! Can't go wrong with that. 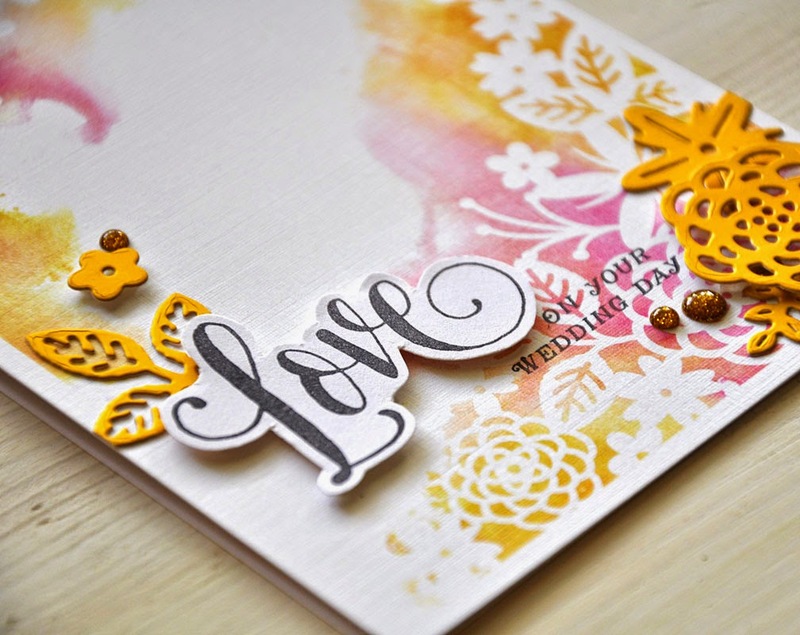 Build your own beautiful cards and projects, created with ease using this gilded collection. Check out all this gilded goodness!!! First up, is a simple creation. A pop of bold color and gilded gold goes a long way. On a white cardstock panel I simply stamped "Love", cut the edge at an angle (with a paper trimmer) and around the "e" (by hand), and attached the panel over a bit of pattern paper. An entire sheet of pattern paper takes the show on this little number. Slightly more involved then the first card, but still fairly simple to recreate. I trimmed by hand the entire word and mounted it on top of die cut Garden Gild flowers. Two simple creations for you. 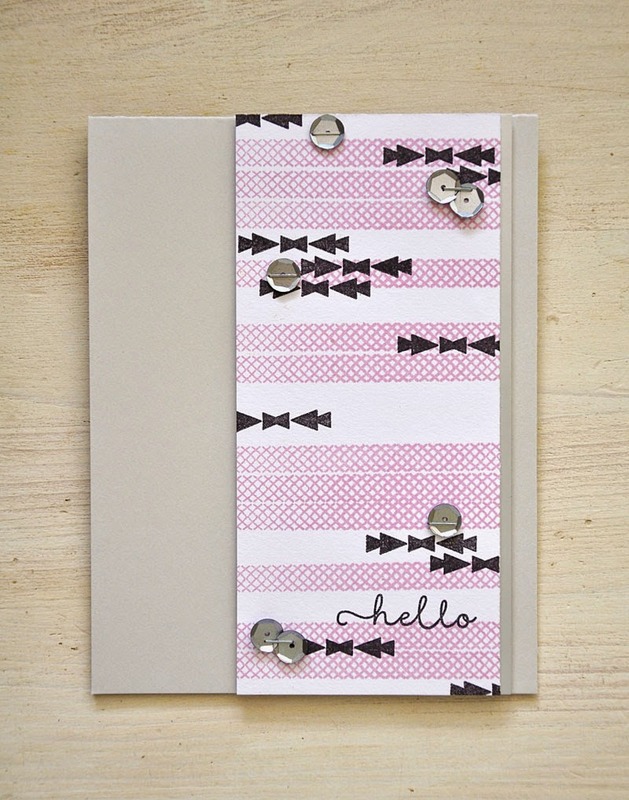 This one features a feminine color combo of melon berry and sweet blush. 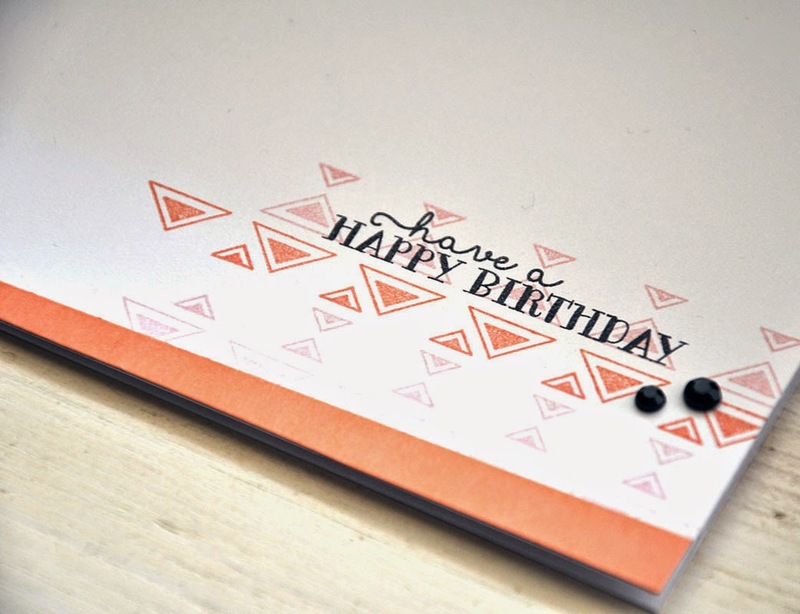 A bit of stamping (using the large and small triangle borders) in the corner. Then finished off with a sentiment, rhinestones and a cardstock strip in melon berry. Very similar to the layout above, but turned upright. This color combo features black, kraft, soft stone and silver. 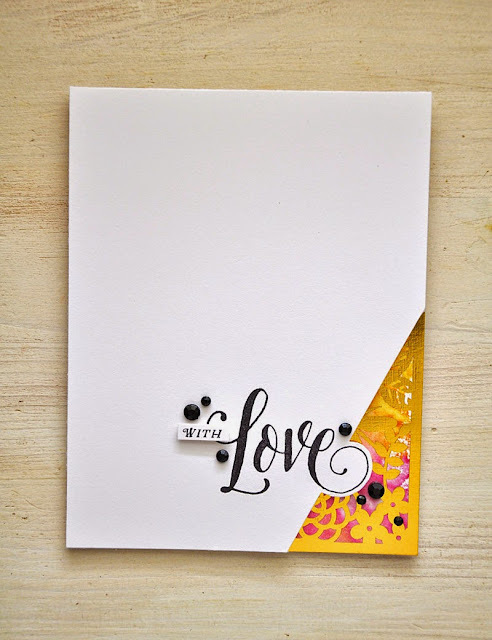 I began this card by stamping the sentiment first, then the three black images and then went back over them in the remaining ink colors. Well, that concludes today's look at the new Make It Market Mini Kit: Garden Gild and Southwestern Style. 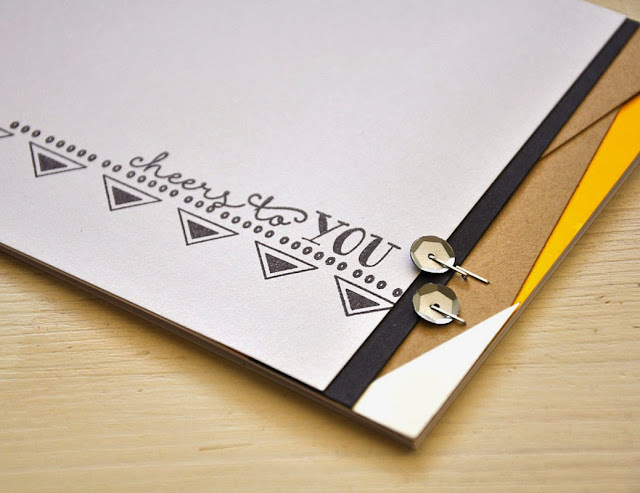 Just remember... all that you have seen today will be available for purchase through Papertrey Ink, beginning May 15th. 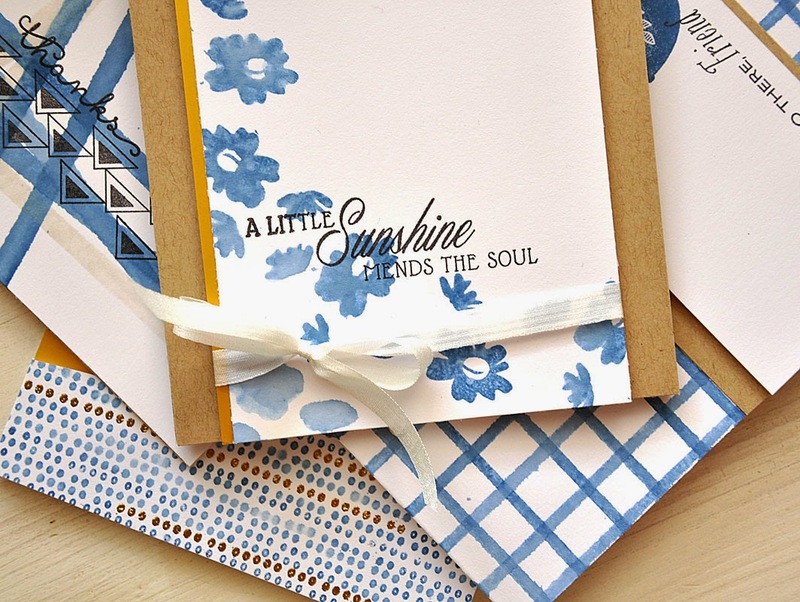 More details on these products can be found at the Papertrey Ink blog. 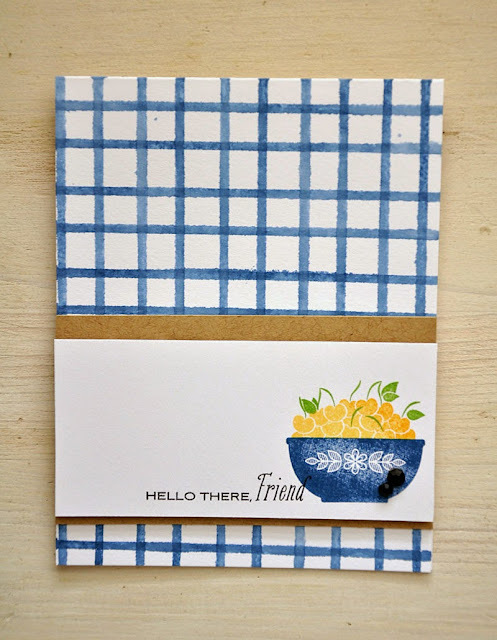 Hello and welcome to day 3 of the Papertrey Ink May countdown! Today is the first group post and it's all about summertime color inspiration! 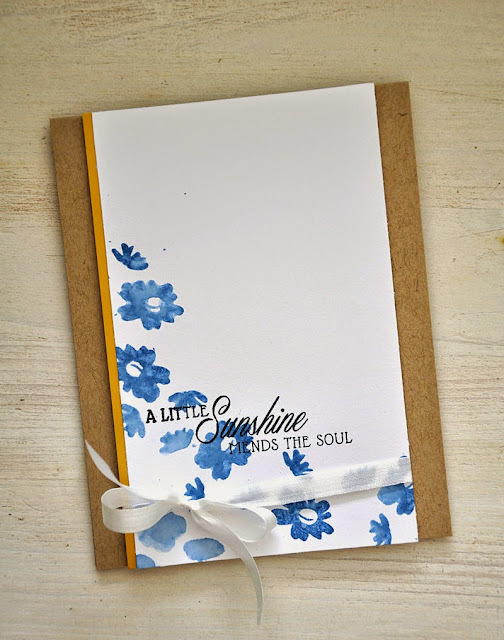 Today we bring you a look at Second Helping of Sunshine (by Lizzie Jones), Quilted: Summer and Plaid Builder (by Betsy Veldman). My color theme for today's projects... Indigo. Indigo is quite the rage in fashion this summer. This watercolor look, in shaded of blue, is popping up in stationary too. It's not your typical summer color combo, but my own wardrobe is filled with these shades of blue and I couldn't help but fix my summer themed projects for today's group post on indigo! My color combo... enchanted evening, gold/summer sunrise/harvest gold, kraft, and a touch of green. My inspiration image above can be found here. First up, a floral take using Quilted: Summer. Here's how... 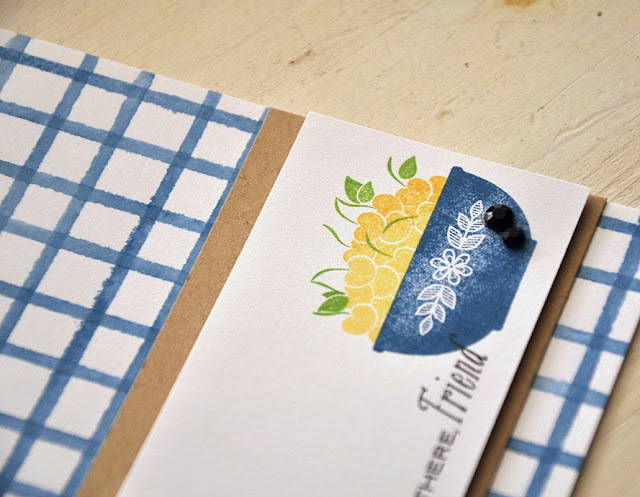 I like to acheive the indigo look by inking my stamps in enchanted evening ink, spritzing with a bit of water and then stamping. Each impression ends up slightly different then the first, it creates varying shades of blue, and adds to the handmade effect. I'm really loving the window pane plaid these days, this blouse... needs to make its way into my closet, stat! I was more than happy to recreate its pattern using the soon to be released Plaid Builder. This plaid building strip is a twofer, two lines incorporated into one stamp. 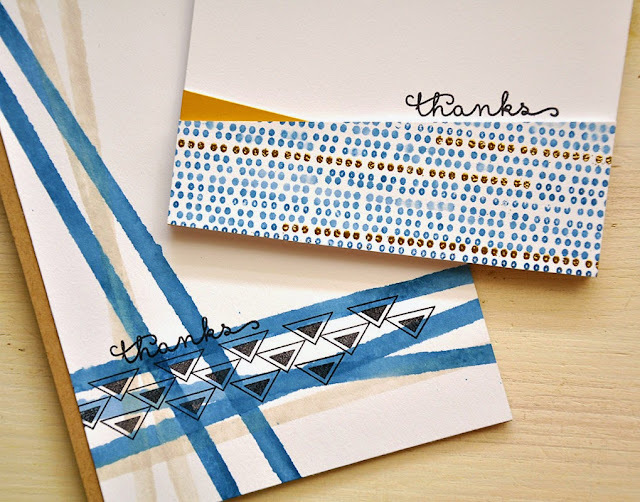 I was able to stamp this pattern in not time! 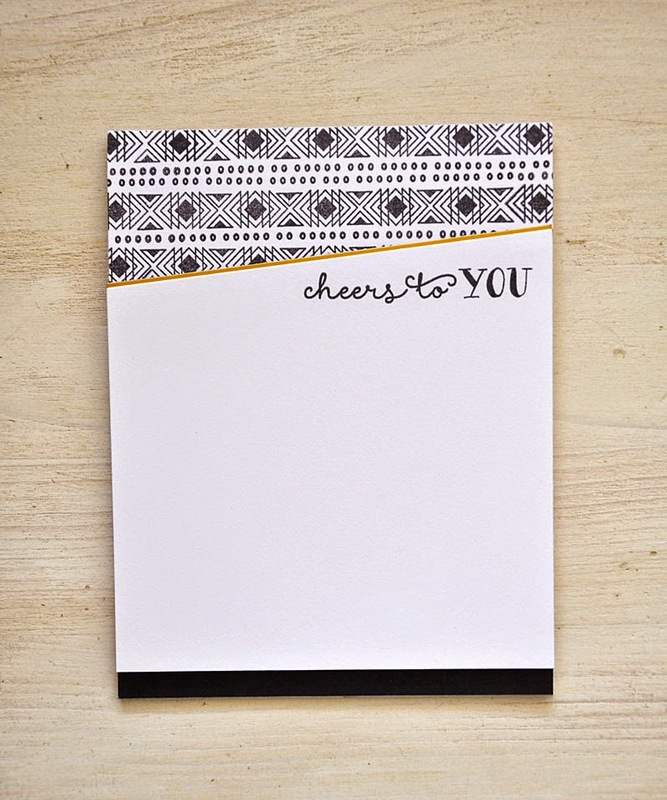 A bowl full of golden yellow cherries (stamped using Second Helping of Sunshine) tops this card off beautifully! Lastly, a look at Southwestern Style in indigo. I think the two look great together! 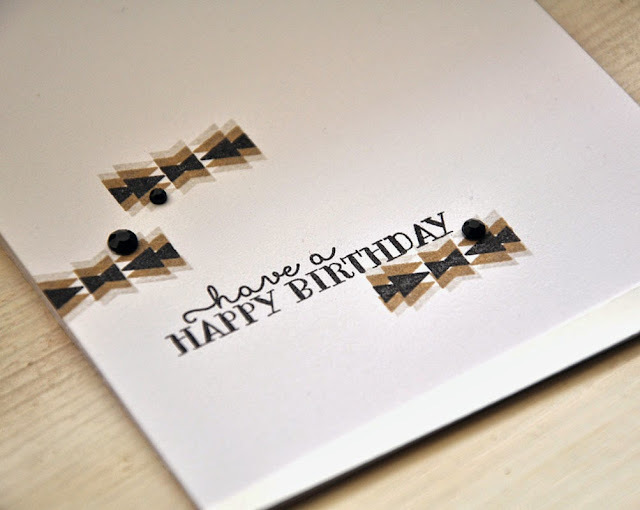 I took the boldest strip from Plaid Builder and randomly stamped it, crisscrossing in the corner. Over the indigo strips, I stamped a triangle Southwestern Style pattern border three times and topped it off with a sentiment. 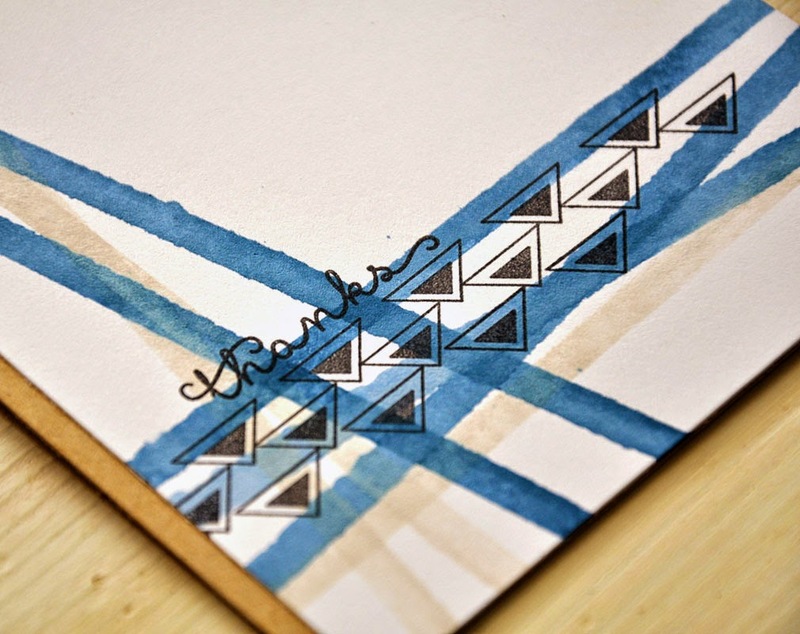 This indigo number was stamped using a single Southwestern Style border. 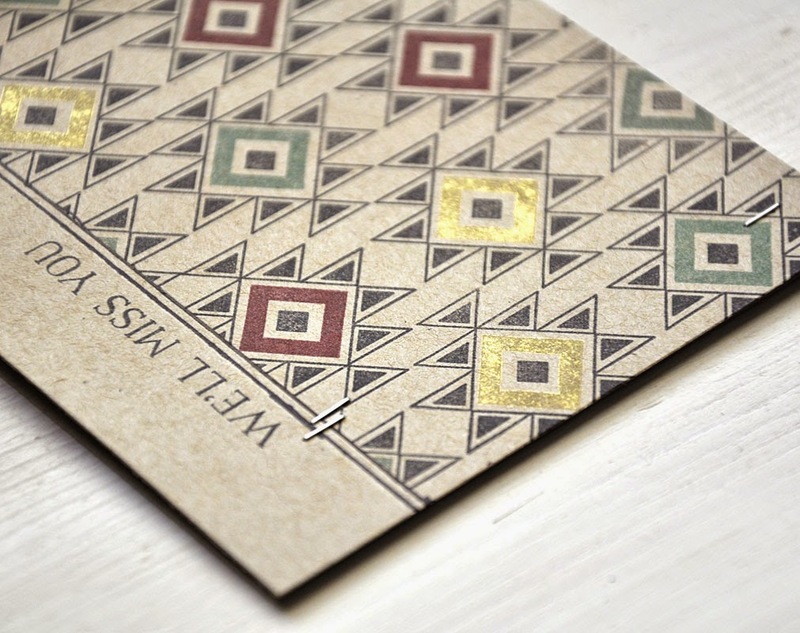 Stamped and embossed in gold. Well, that concludes today's look at Second Helping of Sunshine, Quilted: Summer and Plaid Builder. 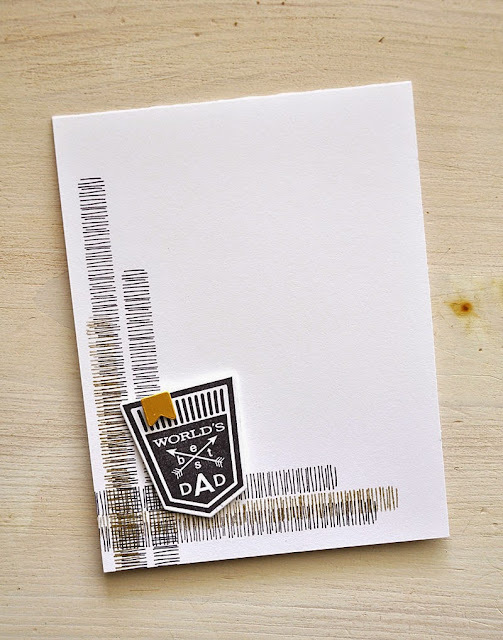 Just remember... all that you have seen today will be available for purchase through Papertrey Ink, beginning May 15th. More details on these products can be found at the Papertrey Ink blog. Hi there! Welcome back for day two of the May Papertrey Ink countdown. I am so excited to feature my newest set again today! Southwestern Style is a versatile pattern building set. Build focal points, borders and backgrounds with ease. With this set a multitude of combinations and color combos are ready at your fingertips. Mix and match to your heart’s desire. These pieces were designed so that they could nestle together making it easy to incorporate multiple colors seamlessly. 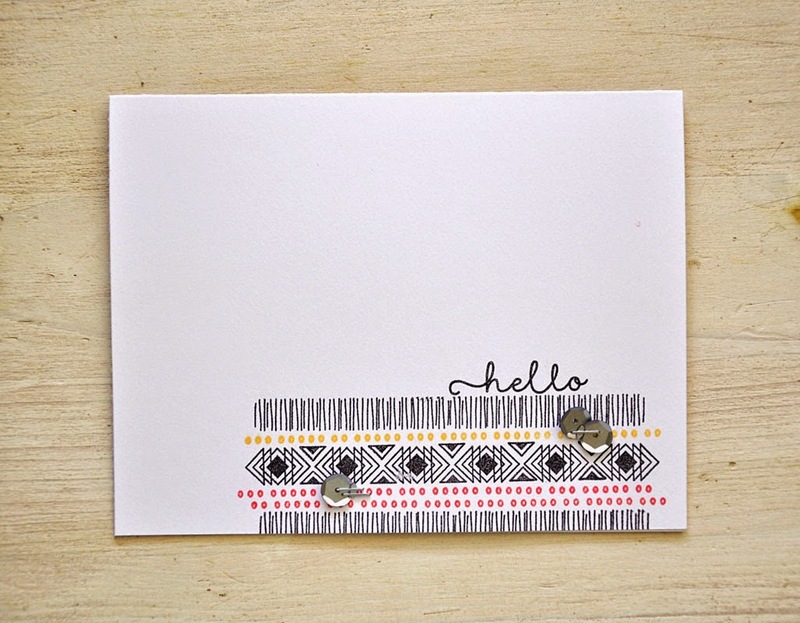 Southwestern Style is a great basic to add to your stamp collection! This card gives you a good sense of the size/length of these pattern builders. Each of the 7 borders measure approximately 4' long. 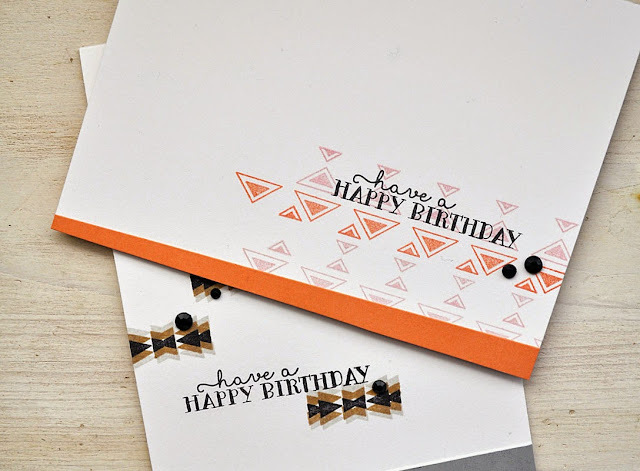 They are short enough to create a focal point, but they can also easily be stamped again to lengthen the pattern and create an all-over background. This card utilized 4 of the 7 borders included in this stamp set. With Southwestern Style you also get 4 go-to sentiments. 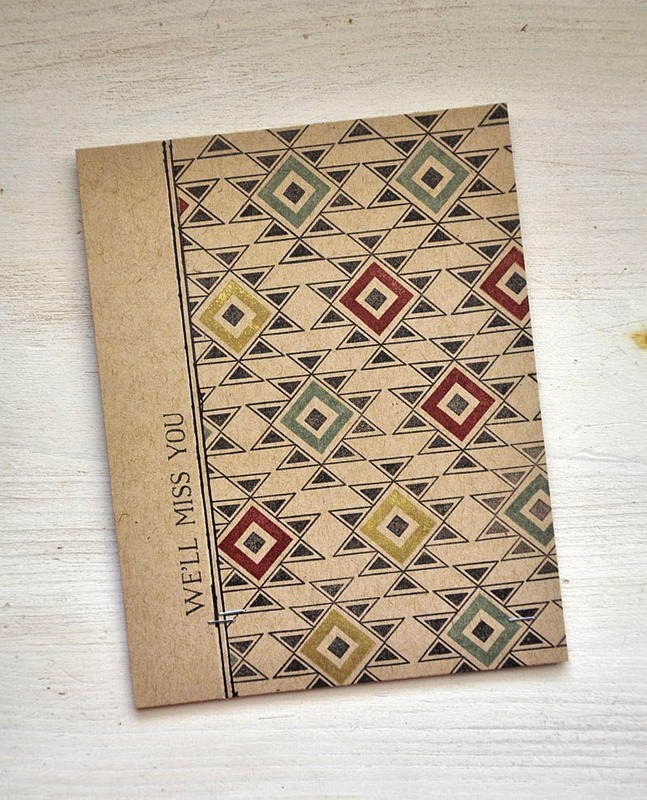 Also included in Southwestern Style are 3 additional images. Two were showcased on yesterdays card and the third is featured here. 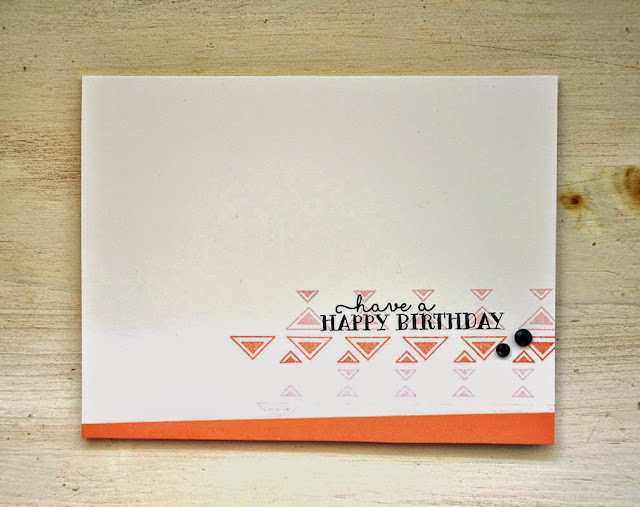 It's randomly stamped in black on top of the lavender moon colored borders. If you look closely you can see the sort of ombre effect effect that's built into the border stamp here. Just a couple of these patterns can really go a long way. I've build a heavily layered card stock edge along the right side of this card (using kraft, gold and silver cardstocks), to balance out the "Cheers to You" sentiment it need a bit more visual weight. So I've stamped two of the borders alongside it, to even things out. 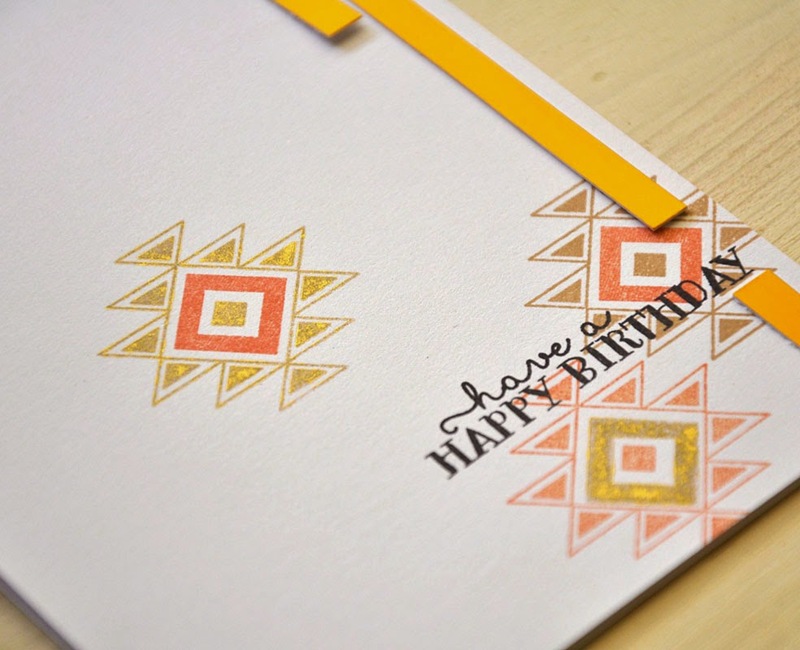 You may have noticed a shimmery theme going on with all of my Southwestern Style cards so far. 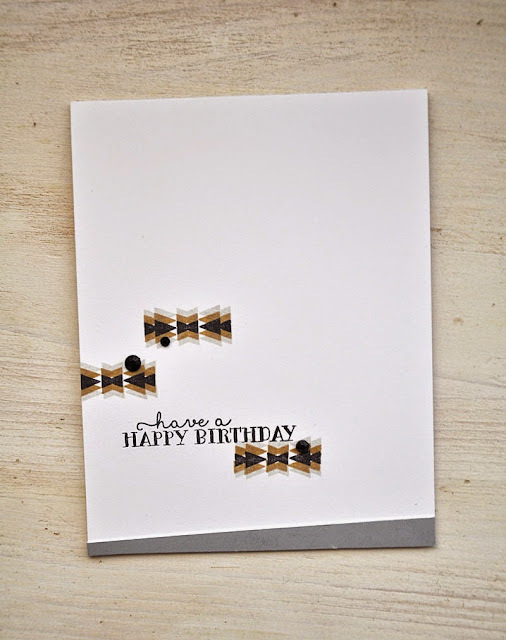 From the use of gold and silver cardstock, silver sequins, gold ink, and even metallic staples. 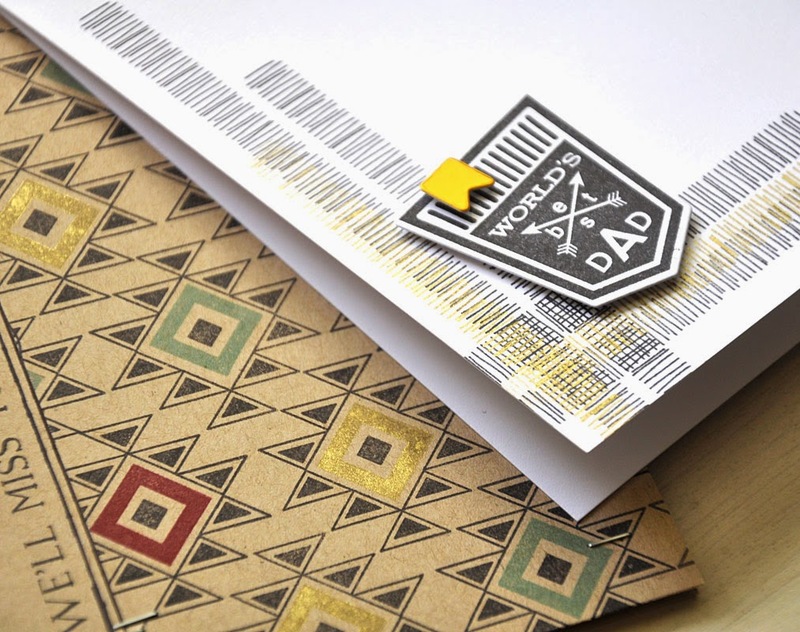 It's a cool effect that goes real well with the sort of edgy vibe this stamp set can give off. Totally what I've been into these days! All are made to coordinate beautifully. Well, that concludes today's look at Southwestern Style. 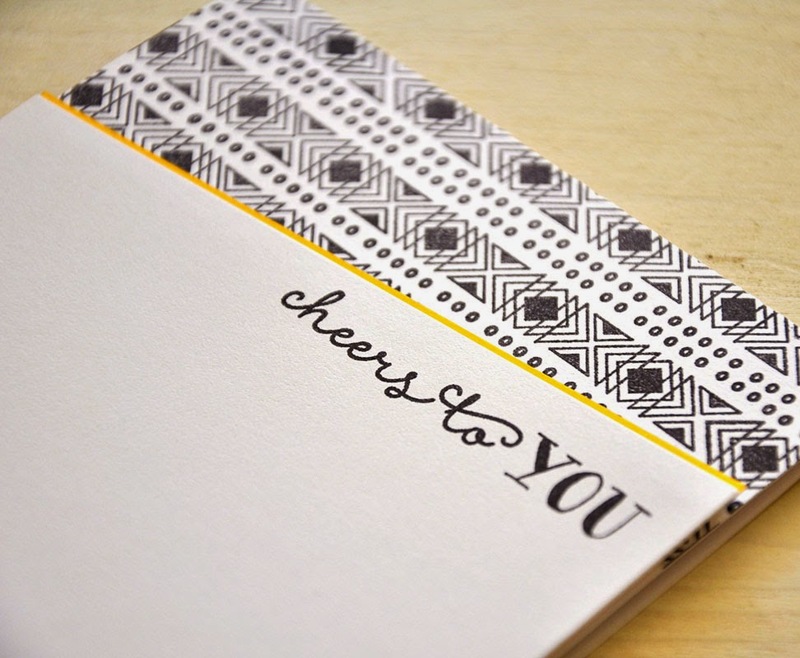 Just remember... all that you have seen today will be available for purchase through Papertrey Ink, beginning May 15th. 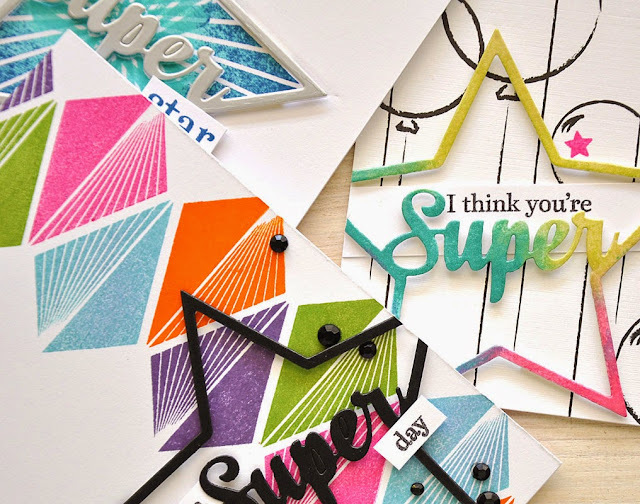 Laura Bassen is working her magic with this set today too, you don't want to miss it!!! Hi there! Welcome to day one of the May Papertrey Ink countdown. I am so excited about today feature! Today I bring you a look at Dawn's new set... Enclosed: Star. 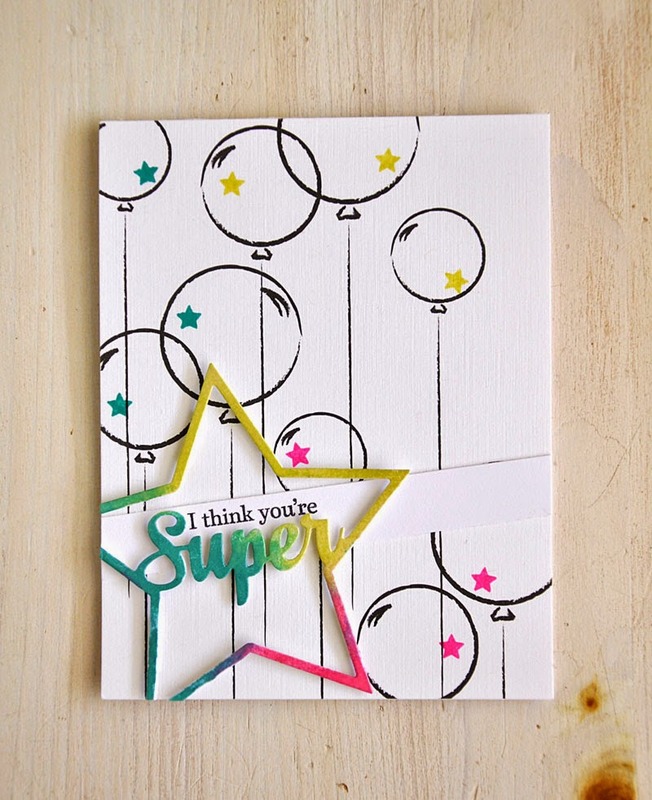 Stars are so versatile and that is proven true with this new enclosed set. 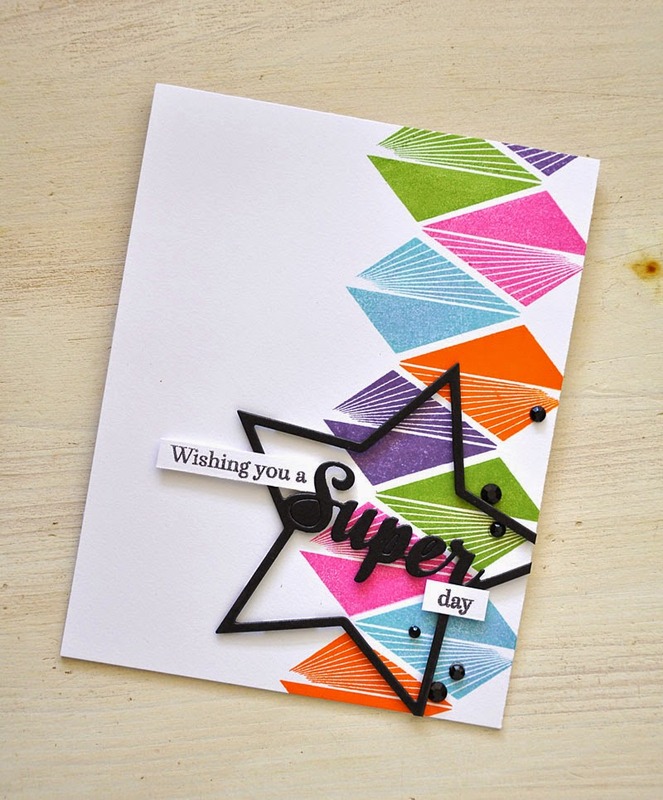 Embellish the star by stamping the patterned points multiple times. Use the word frame and companion sentiment stamps to customize it for the occasion. Have fun layering or keep things simple, the choice is yours! 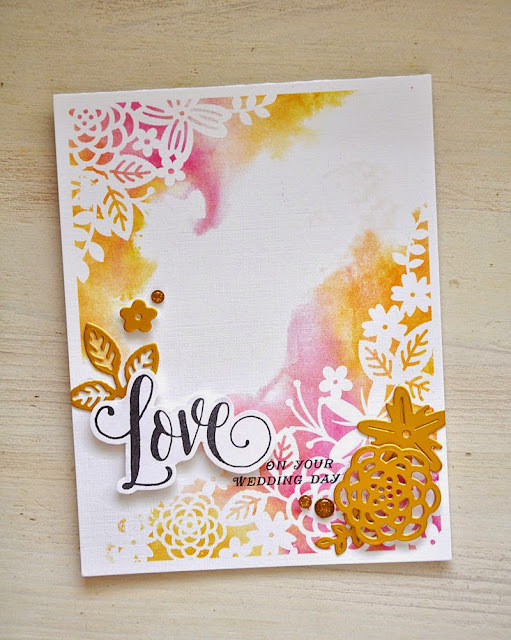 After that, I bring you a peek at the next design in my Stamping Simply line up. Southwester Style! Hang in there until the end, you won't want to miss it. 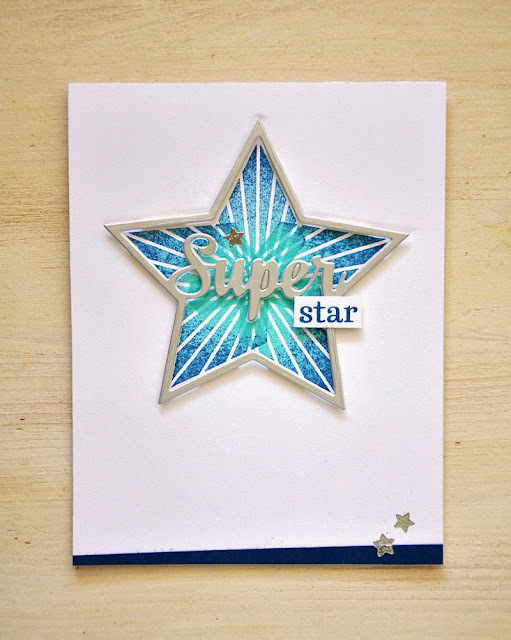 This super star takes center stage. It was stamped using two inks... hawaiian shores and enchanted evening. As a guide, I embossed the "Super" star die onto the card front and stamped within the lines. 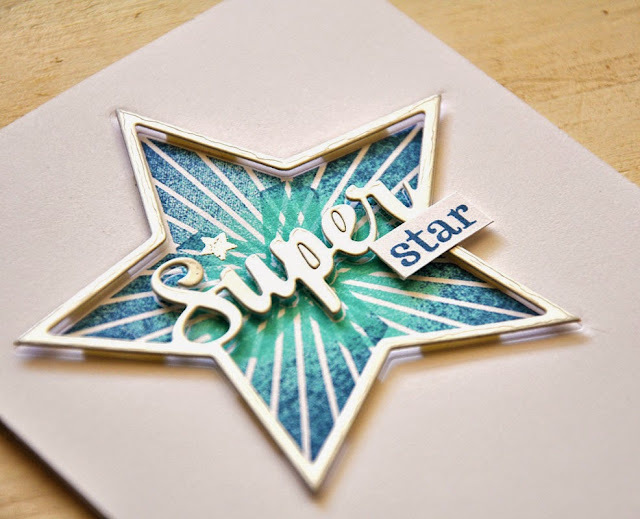 Then topped it all off with a die cut silver star and embellished with a few embossed silver tiny stars. Here's an out of the box idea... I took the star points and hand stamped a bold border pattern. Then layered black accents to create an even bolder focal point, emphasizing the sentiment. 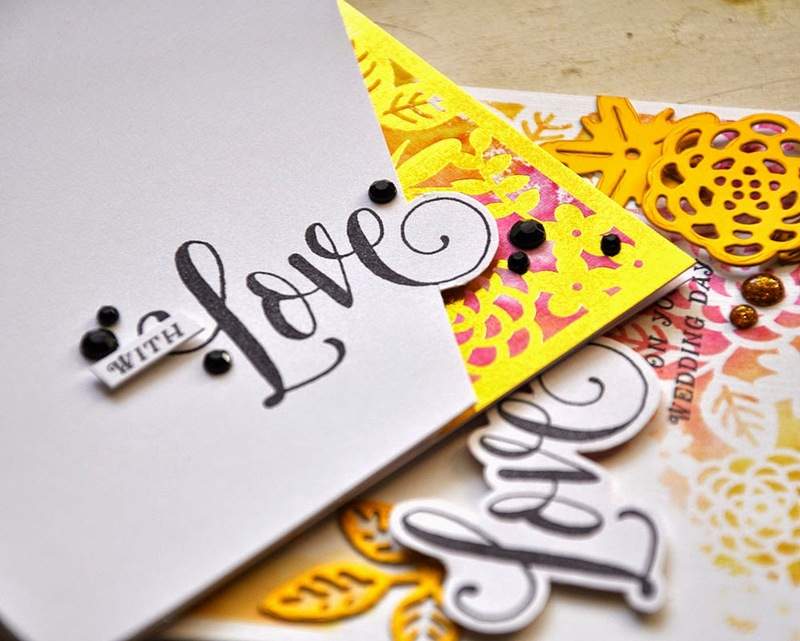 Here I've paired the word frame with a sheet from the Black & White All Over pattern paper pad. 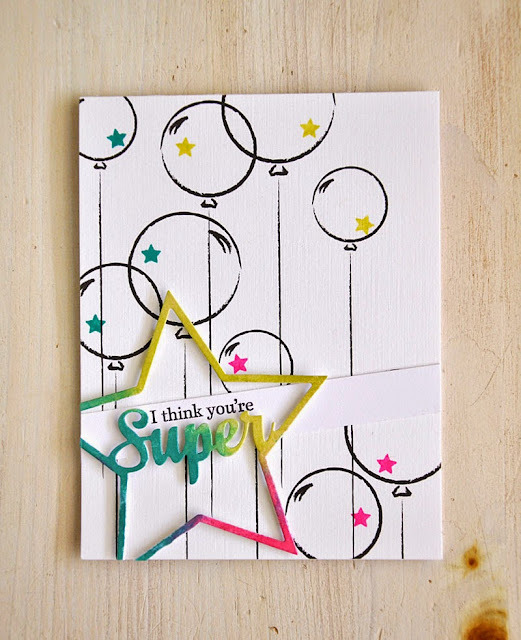 The tiny star from the Enclosed: Star set was stamped in coordinating colors onto each balloon. 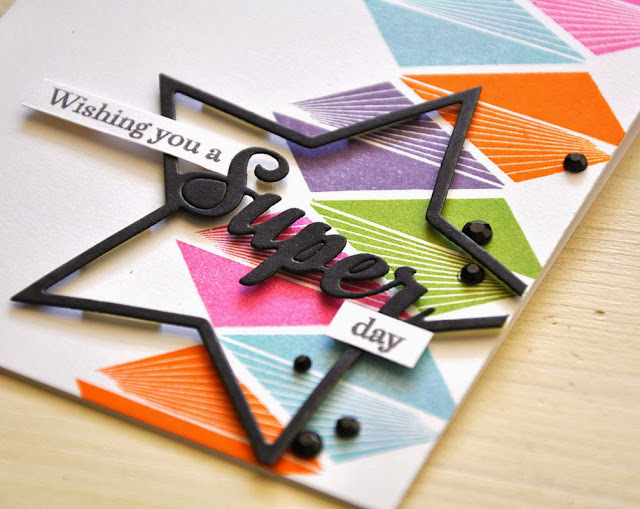 The frame was die cut from shimmer cardstock and then colored using the watercolor smooshing technique. Up, next... Southwestern Style. 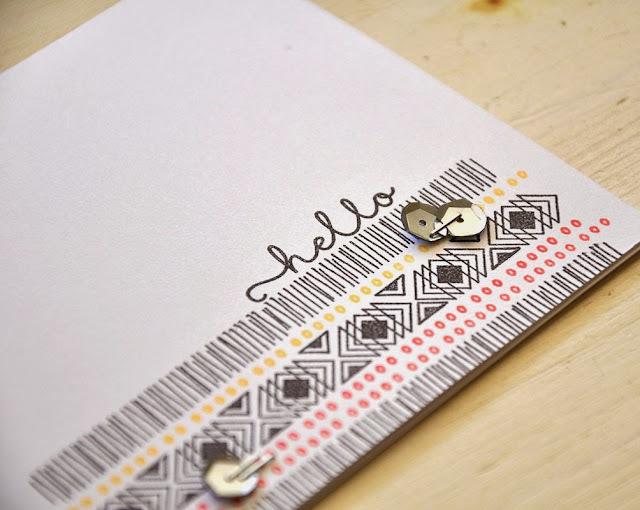 Southwestern and tribal patterns and motifs are popping up all over in both the fashion and decor industries, and this set will let you apply it to your paper crafting projects too! Layer these fun patterns and designs with clever color combinations. 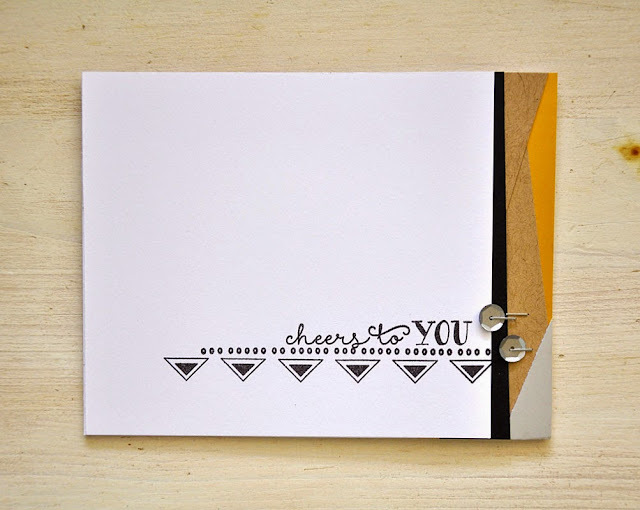 Make entire backgrounds, borders and focal points. Here's a bold black and white pattern stamped using three of the pattern strips included in the set. 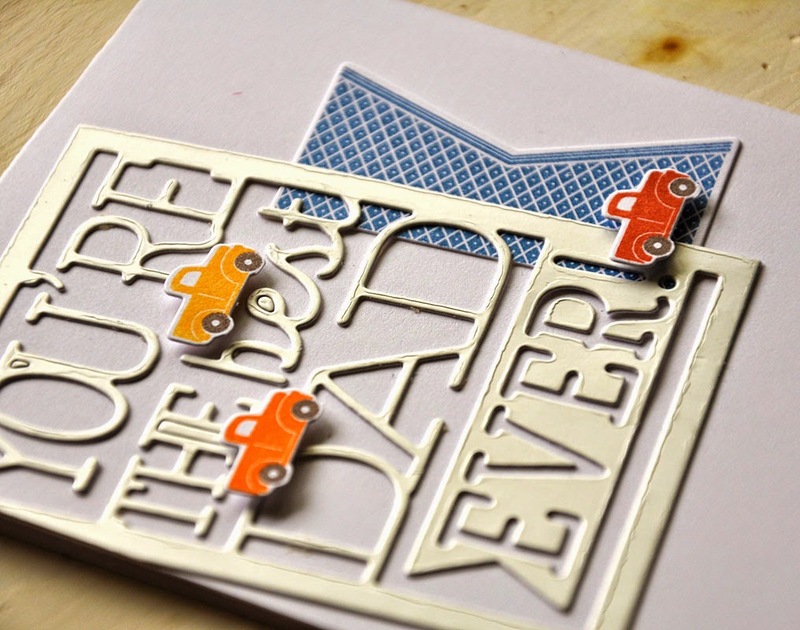 A sentiment (also included in the set) and a tiny strip of gold to finish this card off beautifully. Focal points are a cinch with this southwesterny focal images. It comes in two pieces, perfect for creating a multi-color look. This is a pretty color combo of gold, melon berry and kraft. 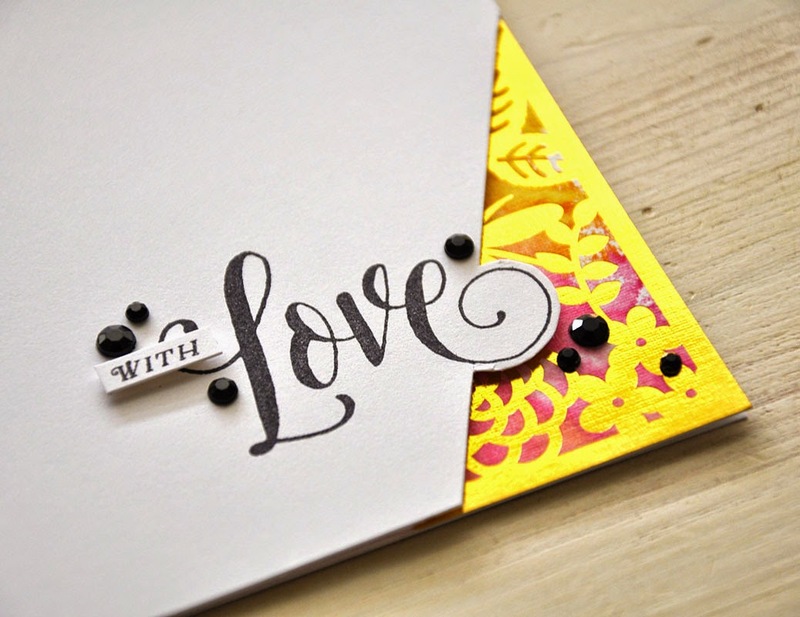 A sentiment a few strips of gold cardstock stapled into place to finished the card off. Well, that concludes today's look at Enclosed: Star and Southwestern Style. Just remember... all that you have seen today will be available for purchase through Papertrey Ink, beginning May 15th.